Customer testimonials about our Crest Ridge Saddlery 100% natural wool felt saddle pad. I know that I promised this testimonial to you a week or two ago. I meant to get it out sooner, but the holidays got in the way! This past week, I have finally gotten to do a bit more riding in my Crest Ridge Sinclair, and the 3/4" natural felt Crest Ridge Saddle pad. To put it bluntly, I am simply amazed with the performance of both products. As you know, I had my Sinclair before purchasing the Crest Ridge Pad. I loved the saddle, but was having issues getting my saddle balanced with the pads I owned, and to get it not to roll. I had tried my Haf Pad (a nice pad but too squishy) and my Equipedic (which is a great pad, but extremely thick). While both of these "high tech" pads might have their applications with other types of saddles and riding, I was finding that although my Crest Ridge fit my mare great without a pad, I didn't have a pad that made everything work together perfectly. With the kind of distance I ride, I really needed a pad that worked correctly with my saddle. Of course, the answer was under my nose the entire time! The Crest Ridge 100% Natural Wool Contoured Pads! I cannot say enough good things about this pad - - it is spectacular!!! From the very first time I tried the pad under my Crest Ridge Sinclair, I noticed a difference. No more roll! The saddle and pad fit perfectly together, and my mare seemed SO relaxed, happy and comfortable. Cherry moves out beautifully, and has a ton of go when we use the Sinclair and the Crest Ridge Pad, while having the room and desire to go on the bit and use her body correctly. In my old saddle and pad, I was getting a ton of tripping and Cherry was constantly "losing her hind end," but with the Sinclair and the Crest Ridge pad, all of those issues are gone, and for the first time, I felt completely at ease with my so-called "clumsy" mare at a canter in the arena -- no tripping whatsoever. 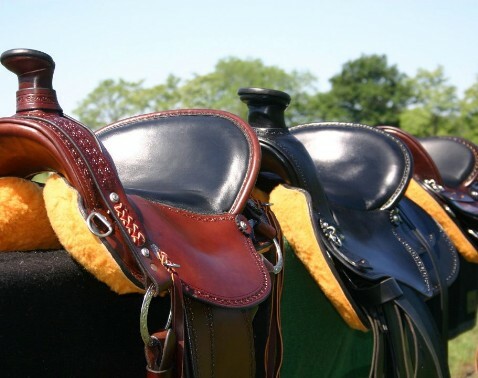 As ever, vcorrect saddle fit is key to excellent performance! Since I am so used to all of the high-tech, newfangled endurance stuff (I board at a barn with a bunch of well-known endurance people). I was initially skeptical of how a felt pad could work so well, and make such a tremendous difference, but it really does! Our vet was out at the ranch the day I received the pad. He noticed my Sinclair (it is a beautifully crafted saddle! ), and he commented on how great the saddle and pad looked on my mare, how well it looked like they fit, and even asked me where I bought my tack! (...of course I told him -- Crest Ridge Saddlery!). Debra said it all when she told me "Sometimes, you've got to get back to basics, girl!" and I now believe every word of it. Thank you to Debra and Sarah for their knowledge, helpfulness, patience in helping me solve my saddle fit problems, and for your stellar customer service. I am a Crest Ridge convert, and so is my (formerly) hopelessly hard to fit mare! Kind regards, Jackie and Cherry (Cherubim's Flaming Sword, a Morgan Mare). Hi again, Deb. Okay, here are the last photos. I went back to the barn after speaking with you today. Put on a white towel, pad and saddle, and off we went. Is it possible that Toby was even happier than before? I think he really liked having the pad under the saddle! ... We only rode for about a half hour, pretty much walking most of the time. Wow, I can’t believe how steam built up under the pad. I can see how it will conform to both the horse and the saddle. What a great quality pad! Hopefully by the fall I’ll be ordering the ¾” pad. I’m hoping that by then he will rebuild the muscle around the withers and not seem so hollow. I will certainly keep you apprised of his progress. Although I board at a small barn, everyone there knows how pleased I am with you and the quality product and service you offer. We will all pass your name around to other friends who may be looking to purchase a quality product (that really fits) at a very reasonable price.